The following is an interview with Michael McDevitt, custodian for the writings of Cora Evans (1904–1957), whose cause for canonization is underway. For several years during the course her life, Mrs. Evans, a convert from Mormonism, claimed to receive detailed private revelations from Our Lord. Although Catholics are not obliged to believe in private revelations, such revelations – provided they're not condemned by the Church – can be edifying. Click here to order a copy of Cora Evans' book The Refugee from Heaven. Matt C. Abbott: How did you come to promote the canonization of Cora Evans? Michael McDevitt: My involvement with Cora Evans began in 1992 when her spiritual director, my uncle, Father Frank Parrish, S.J. (1911-2003), asked me to be custodian for her writings and to help promote her mission. We started with a few small retreats and grew into Catholic ministry offering our services nationwide. You can find out more about that activity at ParishRetreat.org. In 2010 we formally submitted the petition for the cause of Cora Evans to Bishop Richard Garcia, Diocese of Monterey, California. After review by a canon lawyer and others, Bishop Garcia decided to open her cause. He informed the Vatican and was given the nihil obstat by the Congregation for the Causes of Saints in Rome. Her cause is underway and she has the title of Servant of God. Testimonies are being taken, theologians are reviewing her published and unpublished writings, and there is an expert historian assigned to gather everything in accordance with canon law. Cora Evans was a convert from Mormonism, a wife and mother, who suffered greatly for her faith. Only God can make a saint, and we are simply putting her story and profound writings in the hands of the Catholic Church. The way of prayer entrusted to Cora is called the Mystical Humanity of Christ. It is Eucharistic spirituality, encouraging people to live each day with a heightened awareness of the living indwelling presence of Jesus in their lives. Matt C. Abbott: What can you tell me about the life of your uncle – and Cora Evans' spiritual director – Father Frank Parrish? Michael McDevitt: The story of Father Frank Parrish, S.J., is that of a priest for our times, a spiritual person set before the faithful for emulation, especially young men aspiring to the priesthood. Father Frank passed away in 2003, and to this date, twelve years later, when I visit Los Angeles I am still introduced as Father Frank's nephew. I am honored by the connection with this man of great faith who left such a lasting impression. He was Catholic priest who allowed the holiness of God to radiate out to others. He was a teacher, a leader, a speaker, a spiritual guide to many and guided the soul of the mystic, Servant of God Cora Evans. His extraordinary life included his appointment by Cardinal James Francis McIntyre to be the Los Angeles Archdiocesan Director of the Apostleship of Prayer and the League of the Sacred Heart, and his appointment as confessor to Cora Evans by the Provincial of the Jesuits, Father Joseph King, S.J. Father Frank was recognized nationwide from his appearances on the Catholic television program Heart of the Nation. He is best known in Southern California and Jesuit circles for the miracle blessing of a terminally ill priest – Father John Houle, who was dying from terminal pulmonary fibrosis – with the relic of Blessed Claude la Colombiere. The Vatican confirmed the event to be inexplicable. Colombiere was canonized a saint the following year (May 31, 1992). Matt C. Abbott: The alleged private revelations aside, what do you find most remarkable about Cora Evans' life and devotion to the Church? What makes her worthy of being declared a saint? Michael McDevitt: I believe saints are known by their stories. Their lives were given freely to the Lord in response to the circumstances at the time, and for the good of the whole Church. They did not ask for or expect to be in the situations in which they found themselves. These men and women radiated the holiness of God dwelling within them. It is the story of their lives, how they responded to grace, their impact on others, combined with God's proof by miracles in their name that led the pope to declare, "We know for certain this person is with God in Heaven." Only God can make a saint. At this stage there is no certainty that Cora Evans will become a canonized saint. We can emulate the Catholic example of Cora Evans. 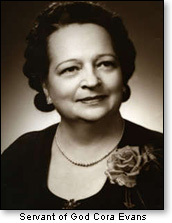 Private revelations aside, the faithful can identify with the life story of Cora Evans, a remarkable woman who practiced Christian virtues and earned a reputation for holiness. The faithful can emulate the virtues of Cora Evans, a woman of faith, a person perceived as a faithful wife, a mother, a person who suffered the loss of a child, a convert who suffered humiliation because of her conversion, and a person who was actively involved in evangelization. Cora set an example of being persistent, courageous, and committed to following God's will. She was obedient to her spiritual director and committed to the teaching authority of the Church. Cora was a writer who overcame the obstacles of lack of education, a person who searched for the truth and someone for whom Jesus was a constant companion.